Brains Dark consistently wins awards at beer festivals throughout the land. It is treacle-coloured with a creamy contrasting head, brewed using chocolate malt, offering a clean palate with hints of liquorice and freshly ground coffee. The intense flavour goes well with pork, or even try with chocolate cake. Dark, nutty and deliciously smooth. 'Dark' is the treacle-coloured with a creamy contrasting head and brewed using chocolate malt, providing a clean palate with hints of liquorice and fresh ground coffee. 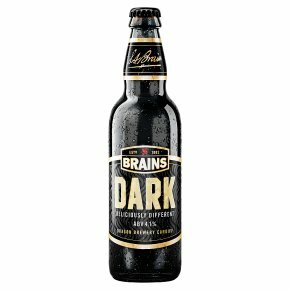 The intense flavour of Brains Dark goes well with pork and chocolate puddings.